It’s official: the Whitworth reopens on 14 February 2015. And to celebrate the gallery’s development – alongside ten opening exhibitions, new commissions indoors and out, and the remarkable achievements of MUMA (McInnes Usher McKnight Architects) – they have put together a Valentine weekend’s worth of art, music, talks, walks, performance, literature, family fun and a fire and light show. For the opening the public will have the chance to discover all of the new spaces, from the new landscape wing (housing a brand new commission by leading Chinese artist, Cai Guo-Qiang) to the beautiful café in the trees. Throughout the day, the curators will give talks in the galleries, while Northern Brass will stage an interactive musical experience for kids, Cornelia Parker discusses the work she has created for our opening, Video Jam and the Hallé Youth Choir put on performances, and the author Jeanette Winterson looks at art. The programme will end in exuberant fashion – with a fire and light show followed by a night of performance art (from Nico Vascellari in collaboration with the French musician, Ghédalia Tazartès), and an after party led by legendary Manchester DJ, Dave Haslam.Bring your dancing shoes – and book for the after party now, as the free tickets are limited. Best of all, everything over the opening weekend is completely free. The Kiran Nadar Museum of Art, was established in 2010 by the avid and well respected collector Kiran Nadar who had the vision to establish a space in which she could share and grow her extensive collection of South Asian Modern and Contemporary art. 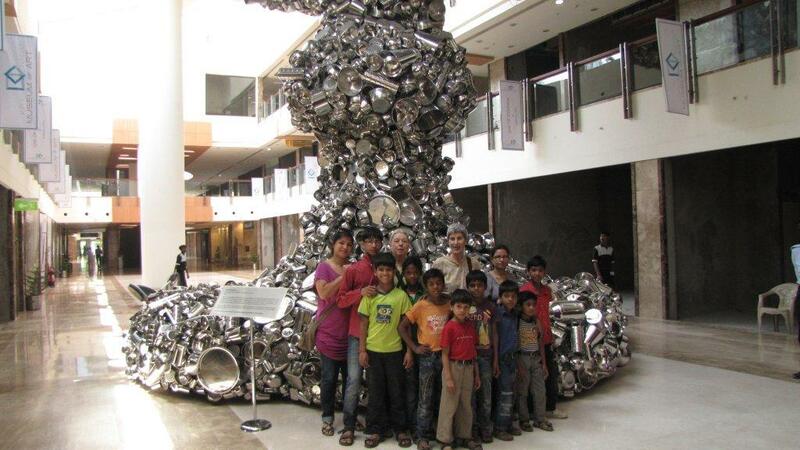 India’s first philanthropic museum, the KNMA was at first greeted with a slight amount of hesitation, but over its short five year existence has quickly established a reputation as a world class museum and art hub. Situated in the heart of Delhi, India’s bustling capital city, this young and forward thinking museum is already changing the future of exhibition making in India. Since Kiran Nadar handed the care of her collection over to the museum five years ago, her extensive collection has continued to grow at a steady rate and now boasts one of the most comprehensive collections of Modern and Contemporary Indian Art, including numerous iconic works by 20th century post-Independence Indian painters and works by younger contemporaries. In 2015, KNMA will, for the first time, tour their 2013 exhibition View to infinity NASREEN MOHAMEDI: A Retrospective to the Rene Sophia in Madrid, Spain; a sign of how highly regarded the exhibitions this young institution produces are in the international art world. With all of its extensive activity the KNMA is rapidly outgrowing its current premises, a commercial unit nestled in-between numerous corporate offices behind the overbearing Saket Walk Mall. This, however, has always been a temporary space as the museum has ongoing plans for a new landmark building, a space which will encompass the organisations ambitions to be a vital platform that encourages the experience of art while stimulating dialogue and exchange. Already outgrowing its current space and with plans for its landmark building fully behind all of its activity, we can expect to see more innovative and dedicated work being done by this growing institution as it encourages active engagement with its collection and greets new audiences. The KNMA’s work is reaching out to the core of Delhi’s citizens and spreading an affection for and appreciation of art which will, without a doubt, have a significant impact on future generations of museum visitors in India. We are so pleased that different organisations join the NWFED and we are always keen to visit and discuss important issues with our new members. The Manchester Metropolitan University’s Special Collections is a brilliant example of how university collections are central to the teaching and training for staff and students. The collections are a great resource not just for the School of Art, the oldest one in the country, but for external researchers, artists and the public. The range of collections is impressive from the international collections of posters, the Arts and Crafts movement collection from the School of Art, the Children Book Collections from the late 19th century until today and the Schmoller Collection of Decorated Papers. The collections are well catalogued and can be researched on line and the staff are really keen for people to visit. A family friendly space operates in the gallery. The key priorities of this small but rich in collections and expertise accredited museum are the move of the collections to a bigger building, improvement of storage for all their collections and raise awareness of how the collections can be used by different University departments such as for example psychology and engineering. The team is also keen to develop handling collections.